Chôhen Kaijû Eiga: Urutoraman (1967) - Sci-fi-central.com. 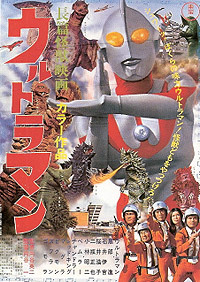 Japan  1967  79m   Directed by: Hajime Tsuburaya.  Starring: Akiji Kobayashi, Susumu Kurobe, Sandayû Dokumamushi, Susumu Fujita, Akihiko Hirata, Masaya Nihei, Hiroko Sakurai.  Music by: Kunio Miyauchi. While investigating two glowing ball-like UFOs chasing each other, Science Patrol officer Hayata is killed when one of the UFOs accidentally crashes into the Mini-VTOL he rode. The being inside, a giant silver & red alien from the Land of Light in the Nebula M78, feels terrible for the accident he caused. So he makes it up to Hayata by combining his own life-force with that of the Earthman, thus bringing him back to life. He also gives him a marker-like device called the Beta Capsule, with which in times of crisis, Hayata secretly transforms into the giant alien, heretofore known as Ultraman! Okay, so my vote is biased. I'm another "child of the '60s" that loved this show in my young age. As a young child, this was pure comic-book, sci-fi stuff, and larger-than-life. A different reality than 'Star Trek' but just as cool in my book at the time. Looking back on the first episode as an adult - I can say that they did the best they could with the special effects and the budget they had. BEGIN Plot line Big monster arrives on earth from outer space or as a result of a mad scientist tinkering with earthly species. The Science Team & (member) Hayata (other spellings have been posted - and I'm no expert) try to get rid of monster. The team's efforts prove mostly fruitless (except in a few episodes) Ultraman (being summoned by Hayata) saves the day with alien gung-fu, special effects, and pyrotechnics in the last few minutes. Intersperse with Japanese humor (and sometimes their interpretation of American 'slapstick' and 'stooge' humor) and a really cute radio-girl. And yes, they had "to be continued..." episodes - throwbacks to stuff like the classic "Tiger Woman" serials that ran before the "B" movies of the '40's. "cliffhangers" - look it up, google it, wiki it, or whatever. This series also featured "drama" episodes that essentially went beyond its own genre - in at least one episode I can remember, the "monster" didn't really want to wind up on earth, it was despondent and lonely and lost and angry about being here - and Ultraman didn't really want to hurt it. It brought tears to my eyes back then - and I think it still might now. If you can find this original series somewhere (or even original episodes of it), it's worth seeing, even if only for world cinema history purposes. But I would suggest rather that you just grab whatever video or rental of this you can find, kick your shoes off, let your imagination run, watch it, and be a kid again. I give the entire series a 6 out of 10 (remember, I'm biased), although there are some episodes that I would still give a "10". The lowering-of-rating factor comes from the fact that (much of the time) the plot lines were very "formula". The raising-of-rating factor is due to several things - one of which was that for that time, the series portrayed some character interactions more realistically so than many other series of that (at the time) sci-fi genre. The monsters weren't always blindly rampaging, sometimes the humans defeated the monster rather than having Ultraman deal with it all (or at least aided him critically), and that characters in the show cared about each other - which you drama students should know 'brings the audience in'. "Monster defeat methodology" got creative on some occasions, and there are beautiful cinematographic shots in the series of some really cool historic places in Japan. If you've enjoyed old sci-fi novels, the Power Rangers, Transformers, Doc Savage, the old Tarzan serials, black-and-white episodes of Flash Gordon, or the old Batman TV series, the Green Hornet, or any "hero-based kids TV show of the '50s through the '70s", then I think you'll like this series very much. Review by Trouvere from the Internet Movie Database.